This publication addresses feeding management guidelines that can improve the success of backgrounding operations and practices that can lower the cost of gain in backgrounding operations. Backgrounding feeder cattle is a common practice in North Dakota. The practice is used to add value to home-raised feeds and calves by marketing feeds through the cattle. Feed efficiency and feed cost are the two most important factors that determine cost of gain. • Place waterers along the fence line. Newly weaned calves will walk back and forth along the fence line for the first few days after weaning. Placing the waterer along the fence line will help them find fresh water quickly. • Allow waterers to run over for a few days following calf entry into the lot. The sound of running water will help attract calves to the waterer. • Feed long-stemmed grass hay in the bunks for a few days following the calves’ arrival. Long-stemmed forage is the type of feed that the calves are most used to eating. • Calves that were creep fed tend to adapt to bunk feeding more rapidly than calves that have not been creep fed. • Commercial starter feeds can work well. Be sure the starter feed you select is palatable. Low levels of fiber or high levels of starch in some products can lead to overconsumption and problems with digestive disturbances. Limiting the availability of these feeds for the first few days, until all calves are bunk broke, may help alleviate overconsumption problems. • When calves have become accustomed to eating out of bunks (usually less than seven days, but this can vary), begin to feed your backgrounding diets. Diet changes should be made gradually. If high amounts of grain will be fed, cattle should be acclimated to high-concentrate diets slowly using “step-up” diets. • Avoid starting calves on fermented or wet feeds such as silages, high-moisture grains or wet byproducts unless the calves have had prior exposure or experience with these types of feeds. These feeds can have odors and tastes that may limit intake during the first week or two of bunk breaking. Muddy lot conditions can cause decreases in feed efficiencies of up to 30 percent. Producers should take steps to reduce problems with mud. Pens should have adequate drainage and slope, which helps move water out of the pen. Pens should be built with mounds that allow the cattle a place to get out of the mud. Design pens so that water drains away from the feeding area. Muddy conditions near the feed bunks will keep cattle away from the bunks, reduce feed intake and depress performance. In cattle fed higher-concentrate diets, severe mud problems near the bunks can increase the incidence of acidosis and other digestive problems as intake patterns become erratic. Spend time on pen maintenance on a routine basis. Taking time to groom pens to ensure good drainage will pay dividends through improved cattle comfort and performance. Cattle generally can withstand low ambient temperatures, provided the animals are given adequate wind protection and kept dry. Wind protection can take the form of wooden, metal or other windbreaks that can be built or purchased. Many farmsteads have tree rows or other natural protection that is helpful in decreasing wind speed. Feed grain processing is an important component of successful backgrounding. Proper grain processing can improve feed conversions, while improper grain processing can lead to increased incidence of digestive disturbances (founder, laminitis, acidosis), reduced performance and increased cost of gain. Specific processing recommendations are noted below. Corn can be fed whole with no processing. Efficiency can be improved by cracking or rolling corn. Gains in feed efficiencies attained by dry rolling corn are generally cost-effective. Barley should be rolled coarsely, cracking the hull while minimizing fines. Barley is fermented rapidly and can be difficult to feed. Fine grinding or fine rolling, which results in high levels of fines, will increase the incidence of digestive problems and decrease palatability of rations due to dustiness. NDSU research indicates that in backgrounding diets fed as a totally mixed ration that contain 40 percent barley, fine grinding improved feed efficiency. Oats can be fed whole with no processing. Slight improvements in utilization may occur when oats are rolled. Oats are one of the easier grains to feed because the oat hull helps buffer digestion of the starch and minimizes the risk of digestive disturbances. Processing oats generally is not cost-effective. Due to their lower energy content, oats generally are one of the more expensive feed grains on a cost-per-unit-of-energy basis. Hull-less or naked oats require minimal processing. Research conducted at NDSU indicates that finely processing hull-less oats will result in poor feed conversions and digestive disturbances. Wheat is fermented rapidly. Wheat should be rolled coarsely but not ground for optimum results. Information on the effects of field pea processing on cattle performance indicates mixed results. Rolling field peas may improve diet mixing and reduce feed sorting. If pigeongrass screenings are fed, they should be ground for optimum utilization. Pigeongrass seed coats should be cracked or seeds will pass through the animal largely undigested. If the screenings are largely made up of light test-weight grain, processing procedures for the respective grains should be followed. Properly processing light test-weight grain is more difficult than processing grains with normal test weights because light test-weight grains generally have a larger degree of variation in kernel size. This variation in kernel size makes setting grinding or rolling equipment properly more difficult. Feeding round bales on the ground can result in excessive losses of feed material because animals tend to use a portion of the feed for bedding rather than eating it. In addition, cattle will refuse to consume hay contaminated with animal wastes. Contamination commonly occurs when hays are fed on the ground. Many types of feeders will work adequately and reduce hay waste. The “Beef Housing and Equipment Handbook” (MWPS-6; available from the Midwest Plan Service offers many plans and ideas for round-bale feeders that can be built on the farm. In addition, many commercial bale feeders are on the market. When round bales are fed, bale feeders should be used to reduce waste. In some cases, 30 to 45 percent waste has been reported when bales are fed without feeders. Grinding forages typically does not increase digestibility, but forage intake usually is increased with grinding or chopping. However, producers should weigh the cost of processing carefully before deciding on a forage-processing system. Chopping or grinding forages can help reduce waste, compared with feeding long-stemmed forages. Grinding forages decreases the animals’ ability to sort or select a diet. This can reduce feed costs by decreasing feed waste. Grinding or chopping facilitates mixing of forages with other dietary ingredients. If rations are fed in a TMR (total mixed ration) feeding system, chopping or grinding is necessary. Long-stemmed forages do not mix well in most commercial systems without some chopping or grinding. Some commercial mixing systems will grind or chop the forage and mix the diets with the same machine. Other systems require a separate forage grinder. Several commercial systems that grind and mix forages with other ration ingredients are available. Forages should be processed only enough to allow thorough feed mixing with other ration ingredients. Bunk management is a critical component for successfully backgrounding cattle on high-concentrate (grain or byproduct) diets. Bunk management can be defined as determining and delivering, in an acceptable and consistent manner, the amount of feed an animal or pen of animals can consume in a given period of time. Cattle fed diets high in roughage generally limit their intake due to ruminal fill. However, cattle fed concentrates can and do overeat. This can result in a variety of nutritional disturbances such as acidosis, founder and bloat. It also can be costly because of reductions in performance of the cattle (reduced average daily gain and poorer feed conversions). Underfeeding cattle on high-concentrate diets also can result in problems. Hungry cattle are more aggressive at the feed bunk, which leads to overconsumption and related digestive problems in some cattle, while timid cattle remain underfed. Producers should develop a feed call recordkeeping system that provides historical data on each pen so that feed amounts can be adjusted based on the previous day’s feed call. Feed amounts typically are recorded on a pounds-per-head-per-day basis rather than on a pounds-per-pen basis. A variety of commercially available computer software systems are available for these purposes. The goal is to provide the amount of feed the animals will consume in a 24-hour period. On high-concentrate diets, use the 10 percent rule for calling feed. Never increase the feed more than 10 percent of the cattle’s average consumption (this will be about 2 pounds of feed per head, in most cases). Increases larger than 10 percent can result in feed wastage or spoilage, increased digestive disturbances and poor performance. It also may be indicative of missed feed calls on previous days and that you are behind the cattle. Decreasing feed calls by 10 percent may be warranted to ensure that cattle clean up feed in the bunk before it spoils. On high-forage diets, do not increase feed calls by more than 4 to 6 pounds per head per day. On high-concentrate diets, feed calls should not be increased more than 2 pounds per head per day. 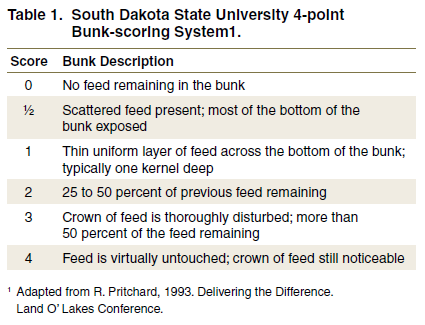 A bunk-scoring system may be developed as a way of judging the amount of feed left in the bunk. Table 1 gives an example bunk-scoring system. Bunk reading is as much an art as it is a science. Wet, moldy feed should be removed from the bunk and fresh feed offered as needed. Stale feeds generally limit consumption. 1) uniformity of feed mixing, 2) uniformity of feed delivery to the bunk, 3) the amount of carryover feed, 4) the amount of fines present in the bunk (as a measure of feed processing as well as a measure of the degree to which cattle are sorting the ration), 5) the amount of ice or snow that may have accumulated in the bunks and pens, 6) the consistency of the stools and 7) the condition of the feed apron (is it covered with manure, mud, snow or ice?). In addition, if any foreign material such as twine, net wrap, metal or trash is observed, it should be removed. When making the feed call, take into account the following items: 1) the previous four days’ feed deliveries, 2) the previous four days’ bunk conditions (what have the feed calls been the last four days? ), 3) the number of days the cattle have been on feed, 4) any other information that may be pertinent and affect feed intake, such as implanting or processing schedules, and 5) adjustments for any cattle that have been removed or added to the pen. Step-up rations refer to rations that are fed to cattle to acclimate them to consumption of high-grain diets. Several systems or methods of stepping cattle up on feed can be used. The system that fits your management style, facilities and equipment the best should be used. In large feeding operations, feeding decreasing levels of roughage as cattle are being acclimated to high-concentrate diets is common. Calves commonly are started on a 45 percent roughage diet, then roughage levels are decreased to 35, 25 and 15 percent, and for finishing to 7.5 percent. Each of these step-up diets is fed for approximately seven to 10 days. Cattle should not be stepped onto the next diet if intakes are increasing or decreasing erratically. Cattle also can be stepped up on feed by increasing the amount of grain that is offered. As a rule of thumb, grain or concentrate should be increased 1.5 to 2.5 pounds per head every seven to 10 days. This will give cattle a chance to acclimate to higher grain levels in a gradual manner. Increases greater than this can result in digestive disturbances and increase the incidence of acidosis. Another way to step up cattle on feed is by initially feeding grain at 1 to 1.25 percent of body weight with free-choice hay. Every seven to 10 days, the amount of grain can be increased by 0.5 percent of body weight until your target diet is reached. Limit feeding a high-concentrate (85 percent or greater) diet also can acclimate cattle to high-grain diets. This type of acclimation requires a high level of management. This system should not be used unless you are feeding a TMR. Provide enough bunk space so all cattle in the pen have access to the bunk when using this system. You should expect that cattle will experience some degree of subacute acidosis during the step-up period. The time (or the ration that the cattle are on) when this occurs varies with each pen of cattle, but it will occur sooner on diets that are more rapidly fermented, such as barley, wheat or high-moisture corn. Larger cattle-feeding operations in the central and southern Plains typically feed cattle two or three times daily. In most cases, this management practice is intended to make better use of labor, feed trucks and feed-milling equipment. Larger lots will feed any pens that have slick bunks first each morning before going back and feeding all the pens. Feed also will be delivered in the afternoon to be sure that all cattle have adequate feed until the following morning. This feeding schedule also helps assure that cattle have access to freshly prepared feed at all times. University of Minnesota research indicates that cattle performance is virtually identical whether the animals were fed once or twice daily. Animal behavior plays a role in determining when to feed. Feeding patterns are correlated with sunrise and sunset. University of Maryland research indicates that peak afternoon eating episodes were more synchronous with time of sunset than feed delivery time. South Dakota State University research also points out that the time of the morning feeding appears to be related more to the time of sunrise than feed delivery time unless the time between sunrise and feed delivery is notably widened. Multiple feeding times give the manager the ability to observe the cattle multiple times per day. If cattle do not come to the bunk for feed, they should be observed closely for possible illness. Some feeders will increase the amount of roughage in high-concentrate diets if they know storm fronts are coming into the area. Cattle typically increase intake before a storm event. University of Nebraska research indicates that this practice does not increase net returns when compared with a system in which pre-storm rations are not used. Digestive disturbances, reduced performance and mortality can occur when inclement weather does not permit you to feed cattle for a day or more. If blizzards do not permit cattle to be fed, the first three to four days following the storm event are critical. The first step is to clear away snow from the feed bunk and apron area to allow cattle access to the bunks. Cattle should be fed a higher-roughage diet for the first three to four days following a storm to allow them to once again acclimate to a concentrate diet. For example, if cattle were being fed a 75 percent concentrate diet, they should be placed on a 60 to 65 percent concentrate diet to reduce the risk of acidosis and other digestive disturbances. Cattle will be hungry and aggressive when coming to the bunk. Aggressive cattle tend to overconsume, which increases the risk of digestive disturbances. Remember that the risk of digestive disturbances increases when cattle are on higher-concentrate diets. In addition, the longer the cattle go without being fed, the greater the risk of digestive disturbances during refeeding. Self-feeders offer producers some advantages in back¬grounding operations. Self-feeders allow producers to reduce labor inputs into the backgrounding operation. Because of labor demands in other enterprises or from off-farm employment, producers may choose to invest capital in self-feeding equipment as a way to save labor. Several types of self-feeding systems are available. With any of these systems, producers must determine whether the labor savings justify the cost of the equipment. Careful daily observation to identify cattle that need treatment for sickness or disease conditions is necessary, whether the cattle are hand fed, fed through a self-feeding system or fed in a TMR system. This is perhaps the simplest method of self-feeding. Depending on the type of feeders purchased or built, the level of investment can vary considerably. Producers may choose to use portable creep feeders in pen-fed situations during a winter backgrounding period. These portable feeders can be used during the summer to creep feed calves or supplement stocker cattle on pastures. In the pen-fed backgrounding system, portable feeders can be used to deliver feed grains such as oats, or byproducts such as wheat midds, corn gluten feed or soybean hulls. These products are fermented more slowly than feed grains such as barley. Consequently, the level of digestive disturbances can be lower when oats or byproduct feeds are used because they contain higher levels of fiber than conventional cereal grains such as corn or barley. In some cases, commercial pellets may be used in self-fed situations. Commercially prepared pellets can be formulated to include feed additives, which may decrease disease incidence, increase average daily gain and improve feed efficiency. Commercial pellets also may contain ingredients that limit intake of the pellets. Salt also can be used to limit intake of concentrate mixes.